Discussion in 'privacy technology' started by The_PrivaZer_Team, Feb 15, 2013.
here is the PrivaZer Team. Thank you all to support PrivaZer, our free cleaner and privacy tool. Maybe it is time for us to join this forum. As already mentioned in this thread, we keep on improving PrivaZer to get it always better. We pay particular attention to what users report to us, updating PrivaZer to implement new suggestions and fix potential issues. And you guys can really help us to keep on building a great tool ! Welcome to Wilders! I look forward to watching how PrivaZer develops. This app easily got rid of my Windows 7 hibernation file I had been meaning to obliterate. That is good. Using it was quicker and easier than digging around in Control Panel to figure out how to do it myself. But yeah, doing it through a program is cool. Welcome to Wilders, PrivaZer Team, Together we can help you become the #1 In-depth privacy cleaner and privacy tool. I've been using your product for some time and think highly of it! The first time I ran it, I was amazed at how many "deleted" objects it found! Thanks for the hard work and the great program! What's the point of having "__" before the word? Plus, I would like to see a shorter context name, something like "SHRED with PrivaZer". No need for "without a trace", since SHRED already means "without a trace". I don't know, what does everyone else think? Personally. being a Star Trek geek, I'd like to call it "Disintegrate". Privazer could say "Send to the Disintegrator!" That REALLY has an air of finality! "Secure Delete With PrivaZer" Sounds more professional to me. 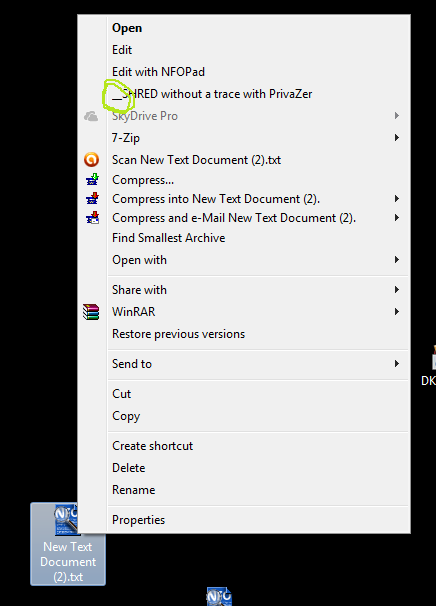 PrivaZer Team, I think by applying these new features to Selected Scans, it would help with more privacy. Ok for "Secure Delete With PrivaZer". Not sure if it will be changed in v1.8 but it will. It sure show's something when you listen to your users like that. At this moment, PrivaZer is the only one real candidate to fight LasActivityView. (Not literally). Privazer Team is paying very close attention to customer feedback. Went to DL the latest version 1.7.1.0 from PrivaZer's www & got this warning ! I "expect" it's a FP, but ? EMET also flags the latest PrivaZer as malicious, DEP shuts it down but doesn't actually shut it down.